Each of us has our “one day” dreams, our personal milestone achievements we hope to experience and then happily check off our “list” before we kick the proverbial bucket. Skydiving, for instance, is one of mine. Beyond this personal bucket list, do you also want to pursue a future of significance and contribution? How about a future that balances learning, leisure and adventure (how you will serve yourself), with personal, professional and community contributions and purpose (how you will serve others)? On Monday, October 1 I conducted a workshop that helped participants envision and pursue the contribution, purpose and significance parts of their future, the counterbalance to that personal bucket list. One of the topics I discussed at this workshop was how the second half of life contrasts with the first half. I proposed that life can be divided roughly into four stages, with the first twenty-five years associated with broad mastery. 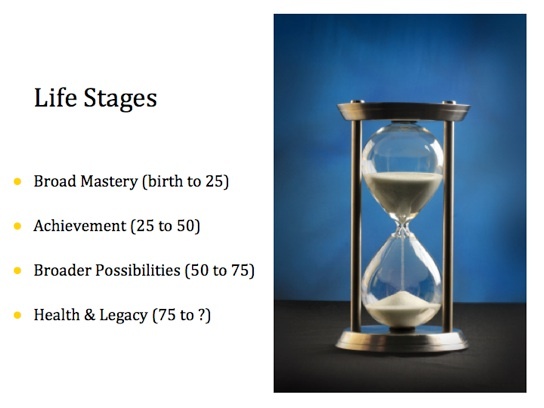 Between ages twenty-five and fifty we tend to drive towards professional and personal achievement. Out second half, starting sometime between ages forty and fifty, gradually evolves to broader personal, professional and community possibilities. If we live to age seventy-five, we enter our final stage where health and legacy come more sharply into focus. “Success means using your knowledge and experience to satisfy yourself. How would you like to shape your second half?